Thanks to a group of young people from all around Spain the countryside of Santiago del Teide has received a face lift. 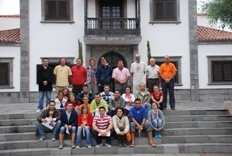 The youth department of the local council invited 20 youngsters from all over the country to join the latest campaign, The Study, Recuperation and Improvement of Rural Areas and Walks of Santiago del Teide. The group of 18 to 30 year old volunteers joined the cleaning and clearing operation during the first two weeks of August. A large proportion of their work concentrated on the areas affected by last year’s fire.